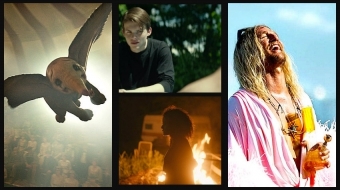 For a year that’s taken more than a little critical drubbing, especially during the summer, 2010 has given us a substantial list of very good films. It was a tough job to narrow this list down to 10. Look at some of the titles that just missed: BLACK SWAN, CARLOS, THE FIGHTER, A FILM UNFINISHED, I AM LOVE, INSIDE JOB, LEBANON, NEVER LET ME GO, A PROPHET, RABBIT HOLE, TRUE GRIT. 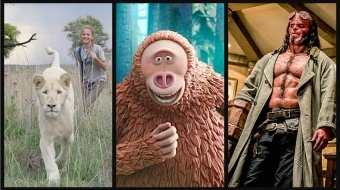 It was also a great year for animated films. I’ve included two, but had to pass over TANGLED and LEGEND OF THE GUARDIANS: THE OWLS OF GA'HOOLE. 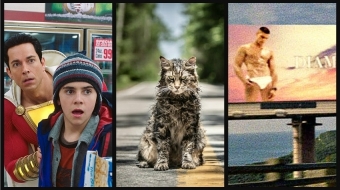 Here then are the 10 films I found the best this year. 1. THE KING’S SPEECH: (a virtual tie with #2). High-class fare in every way, from England. George VI has to overcome a stuttering problem so that he can speak to his people on the radio and keep up their morale during World War II. You’ll feel his struggle through the impeccable acting by Colin Firth, a wise script and accurate details about the condition. But you’ll also have a good time. The central scenes of royal vs commoner sparring between Firth and Geoffrey Rush as his maverick Australian speech therapist are very funny. The history around George is also shown, particularly the abdication from the throne by his brother Edward, played with relish by Guy Pearce. The story of how Mark Zuckerberg created Facebook caught the most topical wave this year, the zeitgeist, some say. He’s even Time’s Person of the Year. He doesn’t come off so well in David Fincher’s highly involving film and Aaron Sorkin’s tight script where he’s a computer nerd who callously dumps his best friend/financial backer and may have stolen a few of the ideas behind Facebook. Both charges come out in lawsuits that form the backbone of this invigorating drama. Pretty good for a business story. Jesse Eisenberg and Justin Timberlake, as inventor and his promoter, are perfect. Yes, it seems so long ago, especially since those two lesser sequels have now been around too. But there it came, in April, bringing us the most interesting female character in years. Lisbeth Salander, the bisexual punk computer hacker is played with cool precision by the Danish actress, Noomi Rapace. She helps an investigative journalist uncover a 40-year-old mystery based on Stieg Larsson’s huge-selling novel. You’ll be absolutely engrossed by the search and more than a little repulsed by what it turns up. (The English-language remake by David Fincher, who directed The Social Network, will be in theatres next Christmas). It’s been a brilliant trilogy and this brings it to a wonderful end. Woody and Buzz and the other toys come alive again and must deal with the big issues: abandonment and even death. Andy’s off to college and his toys are sent to a daycare centre which is more like a prison, controlled by a bitter teddy bear. When Woody and Buzz engineer an escape, we get a large-scale adventure as they dodge the bigger terrors in the town dump. The film is sensitive to the toy characters, the emotions of the children who’ve come to love them and to the nostalgia of adults. There could have been four animated films on this list. I chose this to go with Toy Story 3 because of its wacky humor, its giant adventure and most of all, its heart. Steve Carell voices Gru, a has-been of a villain who has an idea for a comeback. He’ll steal the moon. A geeky rival (Jason Segel), a turn-down for a loan at “The Bank of Evil, Formerly Lehman Brothers” and three little cookie-selling girls complicate his quest. The brisk story turns into an outer-space romp much like Moonraker. Julie Andrews is very funny as Gru’s ever dismissive mother. Was there another movie this year that caused as much discussion and as many bloggers attempting to explain what it all means? Both the story and the visuals are mind-bending, and after the hard to de-cypher first 15 minutes or so, you just go with Christopher Nolan on a spectacular trip and worry about meaning later. Leonardo DiCaprio leads a team of industrial spies into the dreams of an energy corporation heir. They want to plant an idea that will help a competitor. Ellen Page and Joseph Gordon-Levitt are part of it while Marion Cotillard interrupts now and then. There are amazing special effects and action sequences and above all a puzzle that makes this an unusually intelligent blockbuster movie.